NBA 2K17 offers various customization options for the MyPlayer character. The game features unique accessories such as shoes, headbands, tattoos and other amazing stuff for the players. The tattoos in NBA 2K17 are pretty amazing and your player can have as many as you want on the body. NBA 2K17 allows you to create different and unique body paints for your character. Getting a tattoo can be a bit difficult and when you want to apply or equip these tattoos/accessories you may have to go through various menu options. In How to Equip Accessories and Tattoos in NBA 2K17 guide we will show you how to equip accessories and tattoos in NBA 2K17. 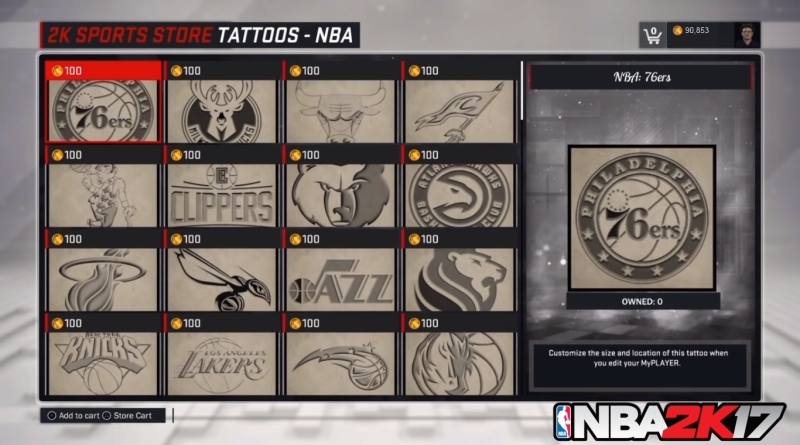 The only possible way for you to get tattoos is to buy them with Virtual Currency (VC) from the store in NBA 2K17. Well if you plan to buy a lot of accessories and tattoos then you have to earn a large amount of VC which can be a time consuming process. You can check out our How to Earn VC Fast in NBA 2K17 guide for more information. When you have some VC in your account then go to 2K Store in main menu of the game. In the store click on Everything Else tab and you can select one of the tattoos category. There are following Tattoo categories; Black & Grey, Color, Letters, and NBA. Now to apply a tattoo to your Myplayer character just go to the MyPlayer Appearance and here choose player customization. Now select Tattoos and then choose a design you want to apply. Now just it select a part of player’s body to paint. Same as tattoos you can also buy accessories from 2K Store using your VC. But there are other ways to get accessories like getting it as a reward for performing different activities. You can get different shoes from the endorsements sometimes. If you have preordered a deluxe edition of NBA 2K17, you should have found some shoes this way. To change your accessories go to 2K store and then select accessories. Now just cycle through the accessories that you have already bought and then simply equip them.